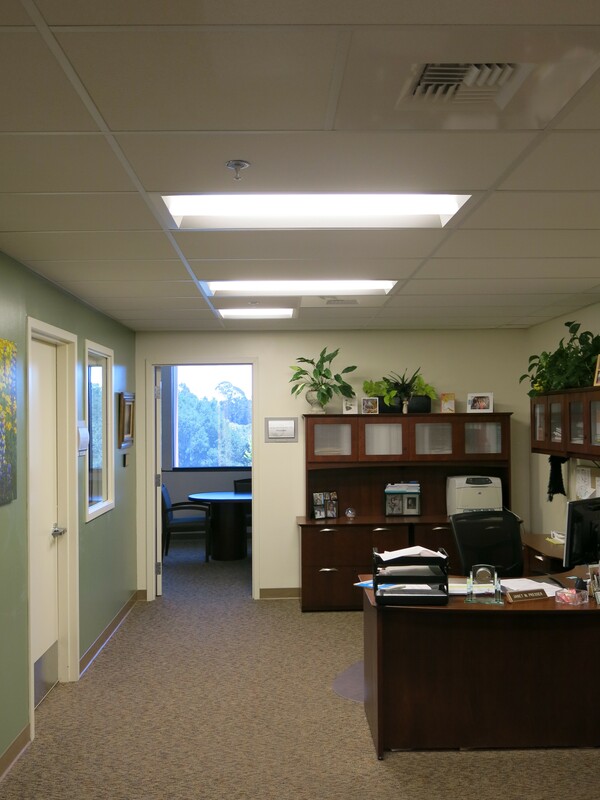 The Palo Alto Medical Foundation (PAMF) has converted two of their Santa Cruz facilities to LED lighting. Replacing incandescent and compact fluorescent (CFL) bulbs with LED screw-in bulbs is happening throughout Santa Cruz county in commercial and residential locations and a variety of these bulbs are sold at many county stores. 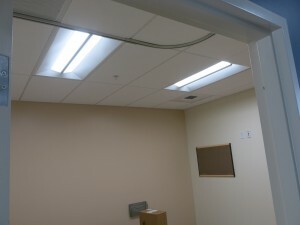 The PAMF conversion is noteworthy because they have replaced their 2′x2′ and 2′x4′ fluorescent lights known as troffers. 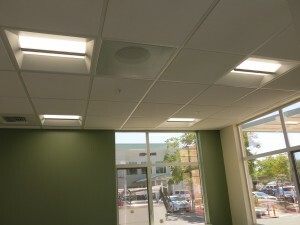 These are the commonly used square and rectangular lights that lay in the ceiling grid alongside the ceiling tiles and are comprised of a couple of fluorescent tubes in a white housing covered with a flat plastic prismatic cover. PAMF installed LED troffers from three different suppliers. Each has a different design as seen in the photos but they also have similarities and improvements over the flat lensed fluorescent tube troffers beyond the improvements in energy efficiency and life expectancy. These are all in a class of troffer called “volumetric”. Volumetric lights are 3 dimensioned: they extend up into the ceiling grid. This breaks up the monotony of the flat ceiling plane making the ceiling more interesting to look at. 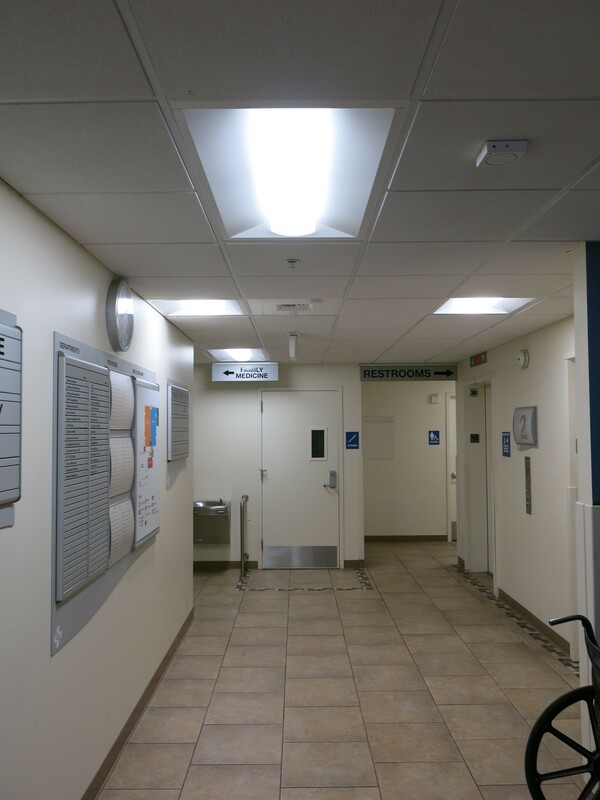 The curved and slanted surfaces of the volumetric troffers are engineered to deliver the light into the room more effectively (maximizing the available light) while also distributing the light more uniformly: minimizing glare, shadows and harsh edges. 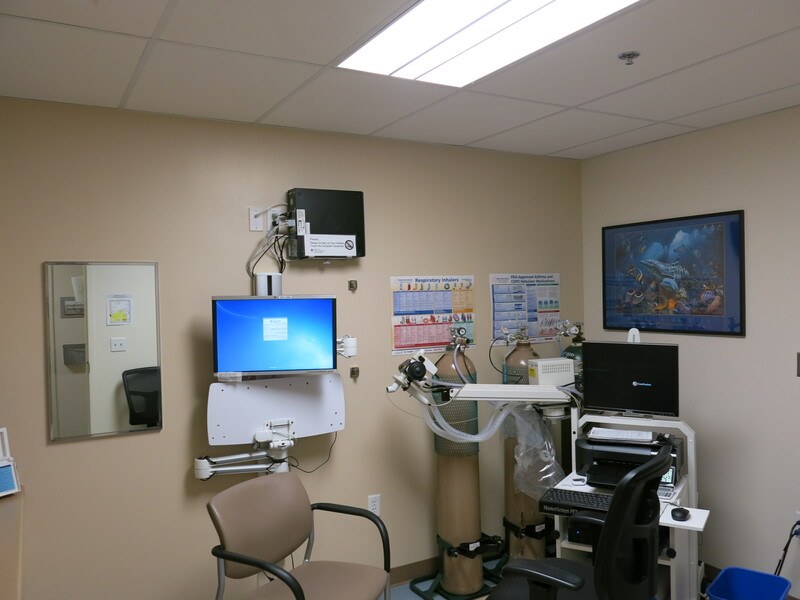 Main Clinic Reduction of costs and improvements in efficiency are two key goals with facilities at the Palo Alto Medical Foundation, a member of the Sutter Health network. With health care needs growing and the consequent need to enhance existing facilities and build new ones, PAMF is paying specific attention to the implementation of LED lighting in their new and upgraded facilities. 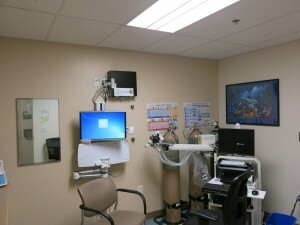 One large project is the retrofit of their existing Santa Cruz Main Clinic at 2025 Soquel Avenue. 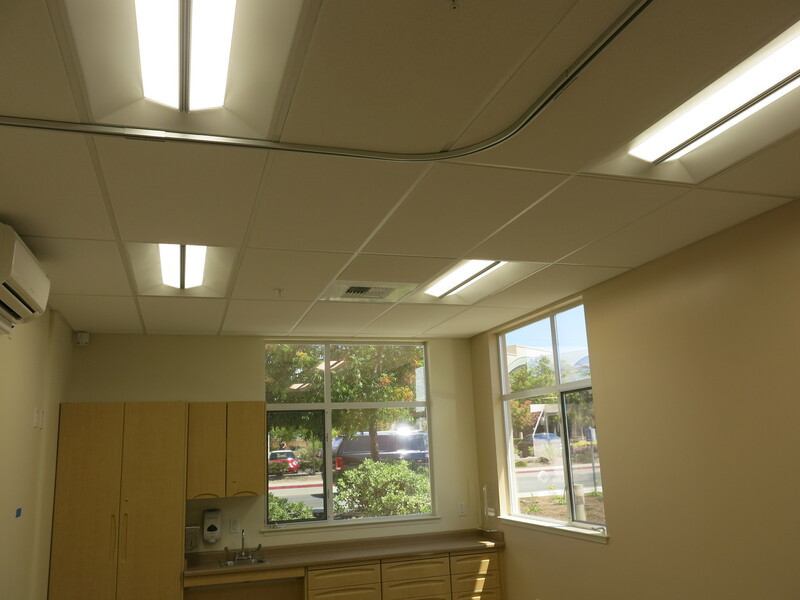 In this recently completed project, over 750 light fixtures have been retrofitted from older, multi-tube fluorescent fixtures to new LED technology. With this retrofit, PAMF will reap a number of benefits, including: -Better light distribution due to the optical qualities of the new fixtures -Improved visual acuity, since the color rendering (CRI) with the new LEDs is higher than that of fluorescent -Reduced space cooling needs, since the LED units emit less heat than fluorescents The new LED products have 10-year warranties, and PAMF expects to largely eliminate the need for lamp replacements. In addition, the new LED lighting is expected to reduce electricity use for lighting by 57%. Lower energy use means fewer environmental emissions, all while improving the lighting for PAMF patients and staff. This high performance 6085 lumen, 3500K color temp, CRI-87, R9 – 32 luminaire is used in the procedure rooms. These attributes provide bright lighting with good color rendering of skin colors and fluids such as blood which are all useful in diagnosis and treatment. - Corridors, open space work areas, waiting area: CR22, 2′x2′ troffers, 2000 lumens each – Individual offices that have only one 2′x2′ troffers: CR22, 3200 lumens each These fixture selections provide average lighting levels that most closely match the recommended levels for the various spaces. 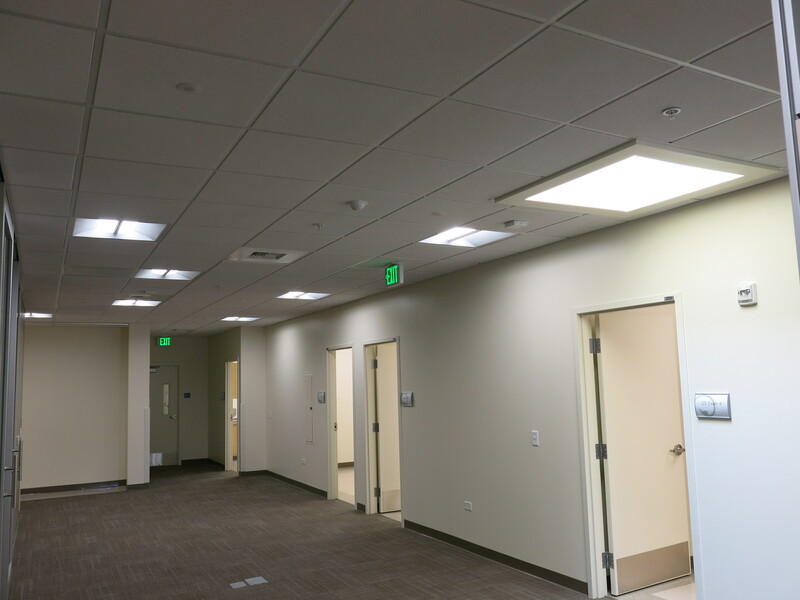 All fixtures have a color temperature of 4000K — that is the closest available match to the 4100K fluorescent tubes used in Phase 1. 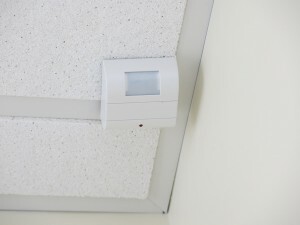 All fixtures have step-dimming which allows the light level to be manually reduced by 50%, a Title 24 code requirement. 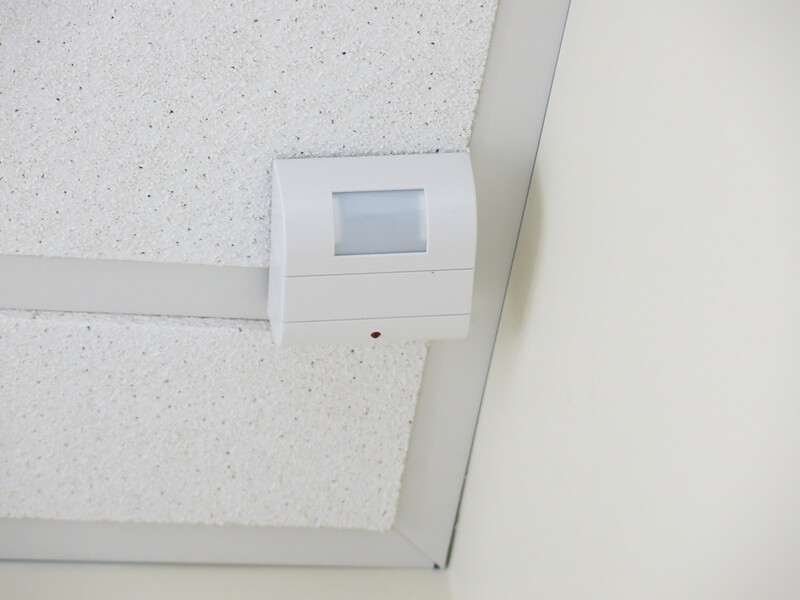 Each office and procedure room has an occupancy sensor to turn the lights on and off. The designated emergency lights have battery backup which will provide 1400 lumens during power outages.